In two weeks protestant denominations will be celebrating the 500th anniversary of the Reformation. The impact of the Reformation has affected every area of life, but perhaps it's greatest effect has been seen in the area of ontology (the nature of reality). The late Francis Schaeffer wrote about this in his famous work "How Should We Then Live?" Below is a summary of this work and why it is important for us to remember the Reformation today. How Should We Then Live? is both intellectually satisfying, and morally stimulating. 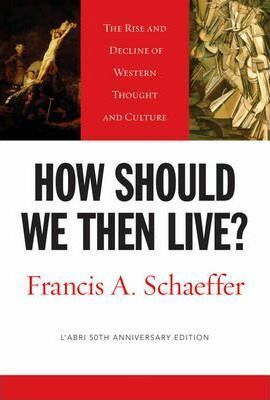 Schaeffer provides his audience with a brief yet rich survey of the ontology of Western thought. As Schaeffer progresses his readers through the annuls of history, they are introduced to great thinkers and artists who have shaped the ideological landscape of the West. We find that the philosopher’s teaching has habitually made its way into the painter’s canvas and the musicians score. Men will operate according to their beliefs about reality, namely their concept of deity. Schaeffer’s warning to the generation of his day is simple: when man deifies himself chaos will ensue and tyranny will result. If tyranny is to be avoided, Western man must return to Christian assumptions about God and truth. I am convinced of Schaeffer’s prediction. He opens and closes his book with a section from Proverbs 23:7. “As a man thinketh, so is he.” Schaeffer’s argument is that a society’s view of reality (most importantly their view of God) will determine their actions and thus their destiny. Schaeffer’s proof is historical. The problem of the “one and the many” has plagued the ontology of Western man since ancient times. The Greek “polis” was not a sufficient foundation for transcendence and as a result the culture fell. Similarly, Roman society fell as both the “gods” and “Caesar” (particulars) were insufficient bases on which to ground the universal. Eventually this culture slid into tyranny, and then corruption. Next came the reign of the “Holy Roman Empire.” However, the Roman Catholic church eventually reached a point in the middle ages in which God was thought to be almost inaccessible to the common man. The significance of the particulars was being lost as they struggled to connect themselves to a distant universal. The result was that an “out of touch” universal was unable to give meaning to the particulars. Honor once again gave way to corruption. The Reformation marks a time in which unity was finally found between the universals and particulars. As a result culture prospered. Education increased, craftsmanship and artistry were of finer quality, modern science was championed, and ethics were refined. A parallel movement in Southern Europe (the Renaissance) promised a similar optimism. Ultimately as this movement blossomed into the Enlightenment a pessimism began to emerge. Schaeffer explains how Rousseau, Kant, Hegel, and Kierkegaard sent Western culture into relativism. Transcendent truth was not thought to be possible. Yet, if transcendent truth is not possible, chaos must be the result. Man himself was not a sufficient base by which to ground the universal. With the loss of the transcendent, man had lost any kind of value by which to place on himself. Man now does what is right upon his own terms. The next step for Western man is tyranny as man tries to somehow bring about order from disorder. These historical examples show Schaeffer’s argument to be sound. Separated from the character of the transcendent God of Scripture, there exists no way by which to unify the “particulars.” Deifying any aspect of creation will ultimately fail. This argument is relevant to our present culture in this way: If Schaeffer’s diagnosis of past history is correct, his predictions for our present are also likely correct. We are sliding into tyranny as governments across the West take more and more control, stifling the freedom of the individual. Our only hope to restore and secure our freedom according to Schaeffer is to look back to the Reformation and worship a God who gives meaning to the particulars.